Eureka! I Love This Thing. At the risk of sounding like an infomercial over here, I had to share about my fun (totally worth it) toy. I have what my husband calls an obsession with reading reviews of products. Believe me, he loves that I do it. He just doesn’t get it. He also doesn’t get my obsession with cleaning our floors. It’s as if it’s my life’s goal to find the perfect cleaning system for what this guy leaves behind. Don’t believe me? Let me break down my cleaning tool “fails” for you. This one? A hot mess. Don’t recommend. This baby? Fine if you’re cleaning a sprinkle of dust that fell on your floor. Three minutes ago. Next up? The sprayer broke. I used it for the mop head for a while, but it just wasn’t cutting it once we moved into the bigger house. This method? It works. Key word: works. It’s tough stuff and not something I wanted to do on a regular basis. And finally…Bona. I love it. Really. It works very very well. It takes some muscle for the mop, however, and I always felt like I was just pushing dirt around. Still recommend it, though. Highly. Well, Nemesis. I think you have met your match. After extensive reviews and dozens of comparisons, I finally decided to get a steam mop. Scratch that. THEE steam mop. I could go on and on about why it’s better than other steam mops, but just believe that I did my homework on it. Plus, the steps are easy peasy. Fill the component (I sound so official) with water. Turn it on and wait about two minutes for it to warm up. Slide the mop across your floor. Like BUTTAH. Sooo simple. 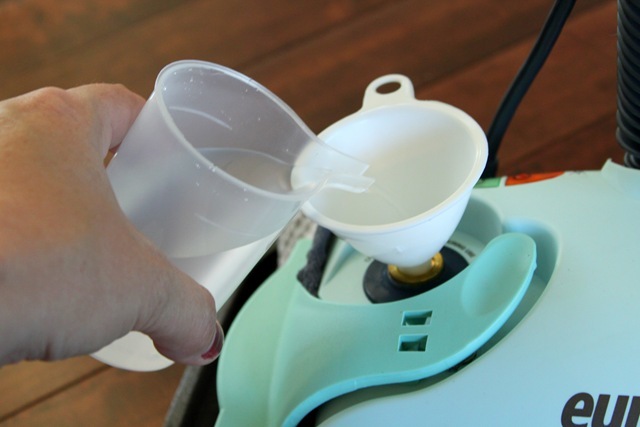 Some reviewers said that it leaves too much water behind for the first few uses. This was my third use (yes, I’m a little obsessed), and I could already tell it wasn’t dispersing as much. As you can see, it’s already drying up after doing this little section. And the final result? Oh-to the-yeah! Unfortunately, it doesn’t get rid of Nemesis scratches on the floor, but it disintegrated every last drool drop on my floor. SCORE! I’m so thrilled with it, I just had to shout it from the rooftops. Or…. Aaaaaand the disclaimer. I didn’t get any compensation for this post. Nope. Just like it. Also, my hardwood floors are sealed—they’ll be fine (thank you for your concern). Lastly, it doesn’t clean the grout of ceramic tile, but I have a deep-cleaning system I like to use for that anyway. The end. What do you use to clean your grout? If you don’t mind me asking. What is your grout cleaning system??? We just ordered a steam mop after so much frustration in cleaning our tile floors. I saw this one while doing my research but ended up getting a Bissel to try out. If we don’t like that one I may just switch to this one as I read really good things about this one as well. So my question, what do you use for your grout? Hi Tiffany, I responded earlier in more detail, but I basically use a manicure brush and a mixture of bleach and hot water. Works brilliantly! I just bought this same one earlier this year. I’m loving mine. I really like that it sanitizes and how easy it is to use. I usually plug mine in, do my prelim sweep and then go for it. I actually really love my floormate. Why a hot mess? I think we home makers ought to share more of this type of stuff. We could all help each other’s homes run a lot better and more cleanly, doncha think? A steam mop? Who knew? P.S. Where did you buy it? Oh yeah! I also have this steam mop and now I finally feel like my floors are clean! The first time I used it, I couldn’t believe how nasty the pad was after, but now it doesn’t get too bad because my floors are that much cleaner! Eureka! Thanks for the review. You have convinced me to give up my swifter and get one. Question though, do you have to buy new cloth pads each time you use the eureka? At $9 a pop, that is expensive and will add up quickly. Thanks again for the information! I’m sold. Good question, Angela. You do not. I threw mine in the washing machine, and they’re good to go again! Yippee! Thanks for the info! If you approve then I knoooow I will. I’m adding it to my Christmas list….ummm….if I can wait that long! Thanks so much for the review. I have been wanting a steam mop for a long time, but couldn’t decide which one to get. Can I ask what your deep cleaning system is for grout??? Thanks so much! I might need to get that! However, I still need to SWEEP with my vaccuum beforehand due to the mountains of dog hair that float around… I need a solution for a non-shedding Lab. 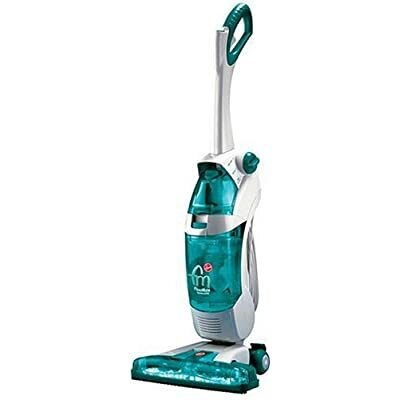 I have the shark pro steam mop and I love it. It actually has 3 steam settings so you can use it on laminate, wood or tile. I’ve been using it on my laminate kitchen flooor for about 3 months and it looks great!! Wow this looks amazing. I have been wondering how these worked. Will definitely have to check this out! I have always liked Eureka products. Chris… I thought these were not supposed to be used on wood floors….? 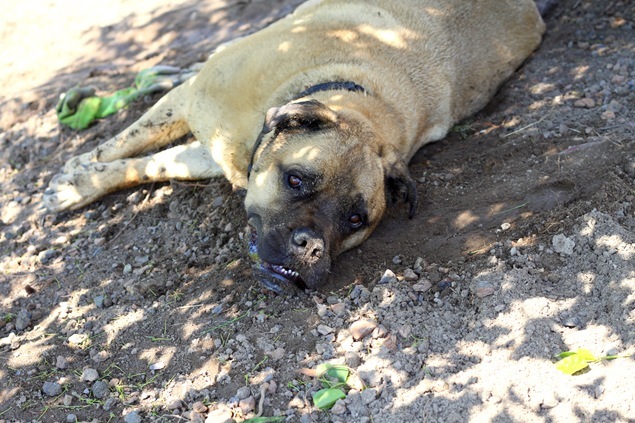 They can be used on sealed wood floors–mine are. Hooray! 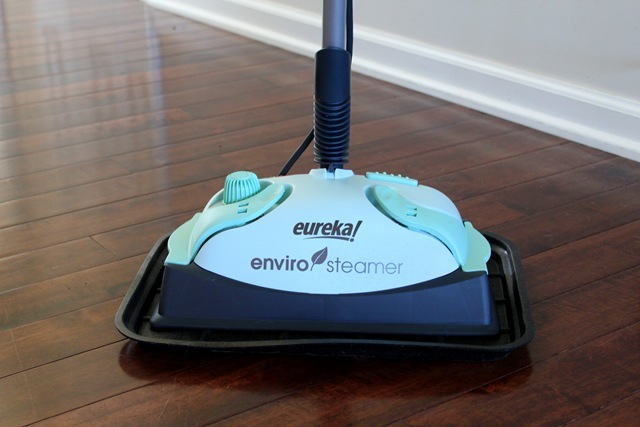 I have a steam mop (another brand) that I use on my wood floors, too. I love it but I have noticed that if I let the floor get too dirty it tends to leave a film! What a timely post….for me, anyway! I also have a dog (a big, hairy lab named Mason) and he drools on and licks (yes, weird, I know!) 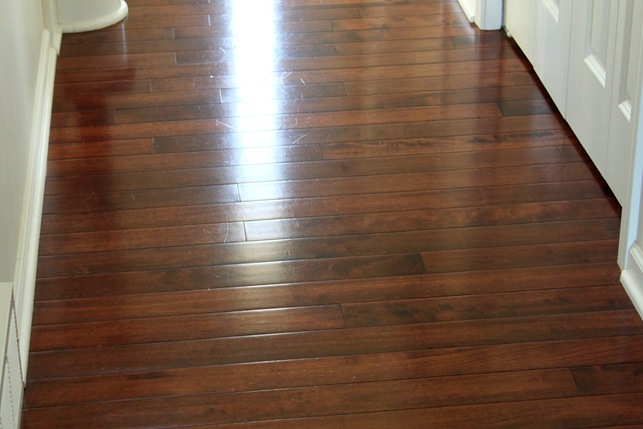 our hardwood floors. The floors never looked nice…..they looked like they had a greasy film on them. After trying almost everything, I found that the Vileda ProMist worked awesome, with just some water and vinegar in the spray bottle. I’m not sure if the Vileda ProMist is available in the U.S., but it is in Canada (for those who are interested). It got rid of the greasy film on the floor (and the drool and lick marks) and it was simple to use. For now, this is my go-to hardwood floor cleaning method. But, if it starts to fail me (like every other method I have tried), I know what to try next. Thanks for the post! Loved it! I love my steam cleaner and use it on all my hard surface floors. When my current one dies, I might have to consider that one. I was wondering what you like to use as far as brooms/vacuum before you steam? I feel like I’m just pushing durt around with my broom, but I’m sick of buying vacuums/floor systems that don’t work. Great question! I just recently purchased a Dyson, and it’s the best product I’ve ever purchased! It’s an adjustable one, so it moves flawlessly from the carpet to the hard floor. It picks up everything. LOVE it. I get the obsession! Glad you found your dream cleaning tool! Ok. That made me laugh! Can it be used on laminate floors? Best Buy. On sale for $70 (I think), and I had a gift card to spend. It was a no-brainer. 🙂 I believe it works very well on laminate floors, but I’ve heard recommendations not to get one that’s too hot? Not sure about that. Ohh, I have a Eureka and I LOVE it too! It’s making cleaning floors soo much more tolerable! Not to mention how well it works. I use it on hardwood, ceramic tiles and vinyl. I love hearing that! I’m glad to see someone else loves it too! Would you recommend it for brick floors? Trying to find something that won’t tear up a mop pad. My mom used one of those regular old cotton string mops with a bucket of bleach water on our brick floor when I was a kid, but I want something that will be easier and not as gross. Gosh, that’s a good question. Because the mop is so easy to glide on my floors, I imagine it would not shred up too easily on yours. I don’t know how rough they are, so it’s hard to tell. However, it’s not a type of mop that you have to push down on. Might work! Can I use this on my laminate wood floors? From what I understand–yes. Might wanna double check since I wasn’t looking at it for those. im so happy you have a new love of your life ;)! 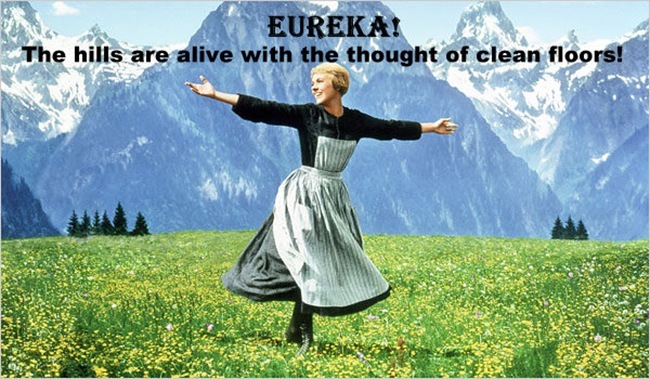 SO love our Eureka! We live out in the country in the Pacific NW and have tile floors, and it’s the BEST thing to make the tile sparkle quickly! We fight a daily battle with mud (especially during the winter) and I LOVE that you can just wash the towel and steam again! 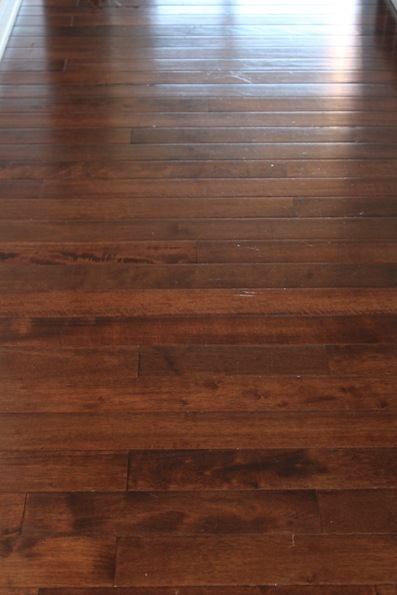 Love seeing it on sealed wood floors as well!! I have an obsession with cleaning floors too! What’s your system for cleaning the grout? This looks pretty awesome. I think I need one! 🙂 My kitchen floor is wood, and SO hard to keep clean; as it’s where everyone comes in the door. yuck! I’ve had an older version of this mop since 2002. It is completely awesome. 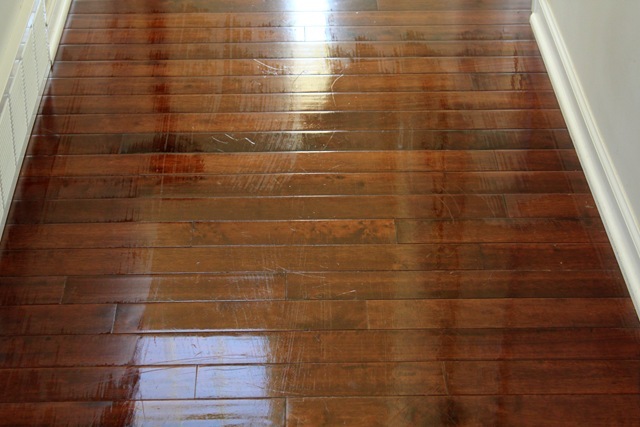 I have found that after a while the shine is dulled on my wood floors, and so I use a hardwood specific cleaner once a month to keep the shine going. Well I never thought I would be so happy to read a review of a steam cleaner but I am doing the happy dance right now. I have been wanting one but just wasn’t sure if they worked as well as they say they do. I am SO getting this. Thank you! I need this. Pulling out the mop and bucket is more work than I have time for on a daily basis, but this looks awesome! I just got my Envirosteamer yesterday and tried it out on all the dried hairspray and dog drool on my bathroom floor. I love it! Thanks for the tip. I can’t wait to try it on my wood floors too! I have all 100% wood stained only floors. Can I use this product on them?